Lullaby is a free-rolling bed, to locate as you please, thanks to its rotating round base. 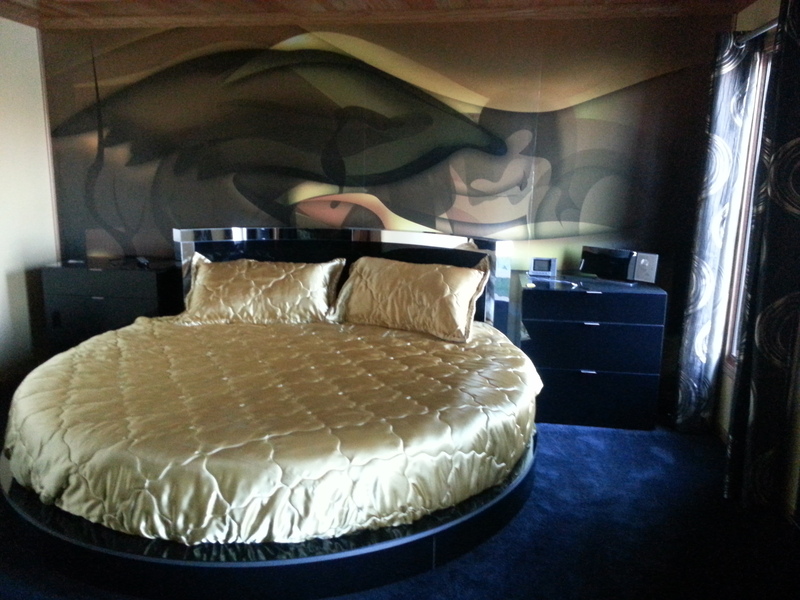 Luigi Massoni’s original design, back in 1968, was retrieved and revised with contemporary features to restore the freedom of that period but suit it to today’s bedroom, which tends to keep an increasing distance from rigid formats.Lullaby Dues’ headboard features a winged profile, cadenced by visible seams, with a steel structure and moulded polyurethane foam padding.This headboard is fitted to a rotating base that will move both clockwise and counter clockwise, thanks to the wheels fitted inside the base itself. The headboard and based are upholstered in Pelle Frau® leather from the Frau Color System or Heritage leather.The platform and base are in multi-ply poplar, padded with polyurethane foam. Lullaby 2 uses Poltrona Frau Notte coordinated items, including a soft throw, specially designed to adapt to the round shape. Over the years, the round bed and mattress has evolved. While many homes still have the traditional rectangular bed, this particularly shaped bed is slowly making its way into a lot of homes in America.